Early on Wednesday, the world found out that famed physicist Stephen Hawking died at the age of 76. Hawking was an inspiration to many people, especially those in science and math fields, and his loss was felt across the internet. On Twitter, many people shared their personal stories of interacting with the physicist—which included several near-misses. Hawking reportedly almost caused several accidents near his home in Cambridge, England. Sarah Parcak, a professor and Egyptologist, was the first to tweet her story. “I nearly killed him, and he me, 15 years ago, when his wheelchair shot out between two parked cars at Cambridge, and I was on my bike. I swerved at the last moment. 100% his fault. God bless you and RIP,” she wrote. Yep – I almost got him once reversing my girlfriends car (which I’d not driven before) out of a parking space at the back of Newnham. Lucky I saw him just in time! This story doesn’t even involve vehicles: one person almost ran into Hawking and had to actually leap over him. I nearly took him out running around the corner of Downing and St Andrews St… managed to leap over him and avoid the embarassment of killing the greatest mind alive! 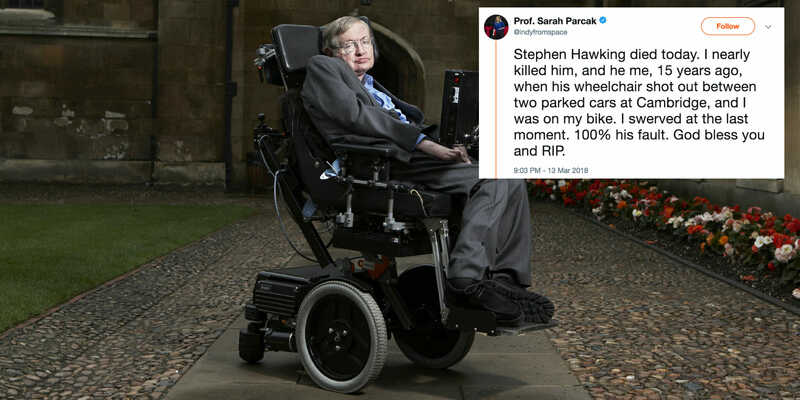 Other people on Twitter saw these stories as a fitting tribute to Hawking, who had a great sense of humor. Hawking was also known to run over the toes of people he didn’t like with his wheelchair.